A category of supplements that describe a setting. 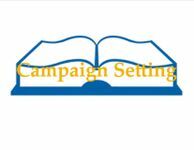 A setting might be system/publisher specific or open for a variety of systems or even all RPG-systems. Some settings use real world backgrounds - like the European/Mediteranean medieval times or the era of the Cold War - some use literary background like the Arthurian legends or certain manga stories and some are totally genuine. There are also differences in density, i.e. how many different social groups and territories are described in a given setting and detail i.e. how much information per territory and social group is given.